I’ve heard the call for years – from fashion magazines and stylish people – to fill our closets with “high quality essentials” as wardrobe foundations. A quick internet or Pinterest search will bring you hundreds of these lists, compiled by everyone from Tim Gunn and Carolina Herrerra to Lauren Conrad. Long before I knew what minimalism was, and years before I ever heard whisper of the term “capsule wardrobe” I was drawn to the idea of having a closet filled with beautiful basics that I could mix and match with ease. I even wrote in a journal as a pre-teen that I dreamed of having my dresser filled with things I could “reach in and grab” and have outfits just …work. Clearly there weren’t other pressing matters to discuss with my diary that day, haha. As I got older and started devouring fashion magazines, I tried to follow their advice – and over and over again I came up feeling discouraged and was left with a closet over-filled with items I never wore. And I’d cram things I half-heartedly bought at stores in the mall or from catalogs (hello, Delia’s!) in there, too. The years wore on and I continued to search for insight – what should I have in my closet to cut down on my stress about getting dressed in the morning? How can I stock my closet in a way that I can easily put together an outfit and get out the door without leaving with clothes exploded everywhere and somehow still feeling uncomfortable in my outfit choice? Asking me (petite, larger bust) to find a high-quality white button down that “goes with everything” isn’t an easy task. And when I have miraculously found this elusive piece and it fit my body well (probably because I had it altered/tailored), it still just sat in my closet, collecting dust. As I’ve pared down (and down, and down) my possessions including those dwelling in my closet, I’ve come to a startling (okay, probably not that startling) realization: a white button-down shirt is NOT an essential for me. Neither is a trench coat at the moment. What are the essentials? That’s up to you. This is possibly more difficult than having a fashion superstar dictate what you need, but it’s definitely a more effective way to build a collection of clothing you love and will actually wear with some regularity. Start by assessing how and where you wear clothes. Then think about what outfits you own that are functional for what you do. Maybe it’s that one top and pants combo you wash specifically so you can bring it on a weekend getaway. Maybe you love a certain sweater or pair of shoes but you know the quality isn’t that great and they are starting to fall apart. Start researching and keeping your eye open for higher quality, longer-lasting versions of those pieces. And by all means, please part with things you don’t wear, or don’t like. This includes things that you might have spent too much money on or were a gift and give you tiny pangs of guilt every time you see them. Give them away, sell them. If you are interested in adding high quality pieces (especially basics that you know you’ll wear a lot) but are intimidated by high price tags, check out consignment stores in person and online. They are also a good option if you’re feeling like your weight or body shape might change in the near or medium future (like you’ve just had a baby, etc.) My favorite online consignment store at the moment is thredUP. Get $20 off your first thredUP order by clicking here. I was the same as you were! I always bought into those lists that said I needed a leather jacket and classic black pumps when that’s not really me. Now, I try to focus on what my favorite items are in my closet, why I like them, and try to buy clothes that fit that particular criteria. Nice! Yeah it would be convenient if there was a master list but we have to figure it out on our own! Haha exactly! Thanks for the comment! I had to laugh! I don’t wear blouses due to having worn them forever growing up – my school uniform! I don’t need a trench coat either! I love your blog – just found it today and love it! My fav candy – jellybeans! 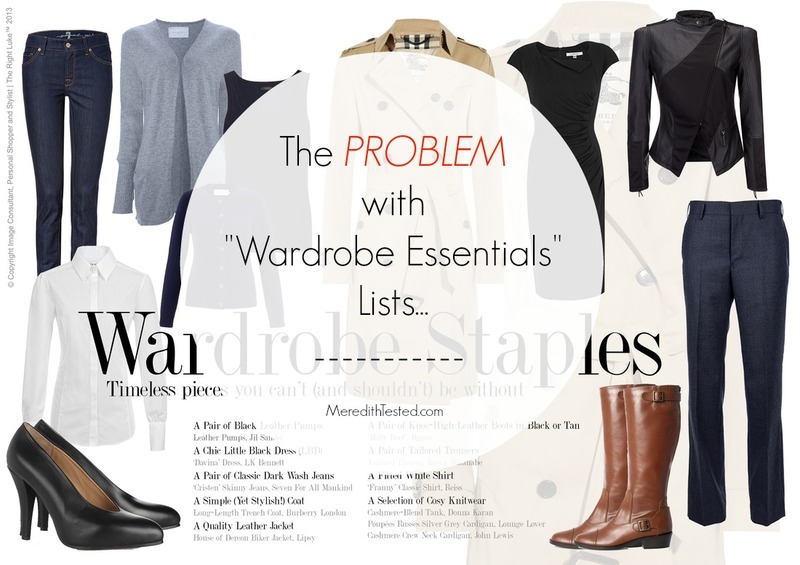 Following a list of what should be in your closet deprives you of your personal style.